Today’s piece is a commemorative family Rosary. This Rosary is made with multi-colored nuggets as the ‘Hail Mary’ beads, the color represent each of the children’s birthstone. The ‘Our Father’ beads are double sided with pictures of their children on one side, and the children’s patron saint on the other. The centerpiece is the Divine Mercy on one side, and a hand written prayer by Mother Theresa; it is actually a print of her handwriting! 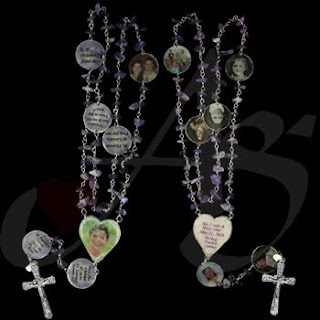 The lower two ‘Our Father’ beads are of their wedding picture, accompanied with the family picture, and the patrons of the family. This piece is not available. 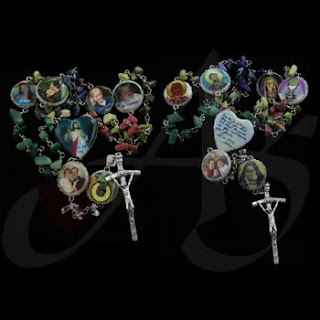 If you would like your own commemorative rosary, or nay unique piece of jewelry; contact us! Don’t forget to stop by our Facebook page, Google+ page, Twitter, or our website for more ideas for your family Rosary! Today’s piece is a bracelet. 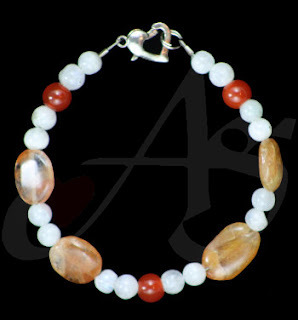 This piece is made with oval red carnelian, round red coral, and round white quartz beads. This piece is strung on 26-lb limit steel cable. The heart clasp here is made of sterling silver. This piece is no longer available. If you would like a similar piece, or any unique piece of jewelry; contact us! Don’t forget to stop by our Facebook page, Google+ page, Twitter, or our website for more great pieces of jewelry! Today’s piece is a tie chain. This article of gentleman’s clothing is a unique way to weight the tie without having to pierce it. The hook goes on a shirt button, the tie passes through the center, and the hand twisted design is visible on the exterior. This piece is made entirely of hand twisted brass wire. This piece is currently available! Today’s piece is a watch. This watch is made of sterling silver chain-maille. Unlike normal watches worn on the wrist, this watch makes a hook to wrap on any object; purse handle, belt loop, computer bag, jacket, or any other object with a loop. There are copper pieces linked into some of the sterling silver to add a flair to the watch. This piece is currently available. If you would like this piece, a similar piece, or any unique piece of jewelry; contact us! Feel free to stop by our Facebook page, Google+ page, Twitter, or our website for more great pieces of jewelry! Today’s piece is a necklace. This necklace is made with blue ratstail. 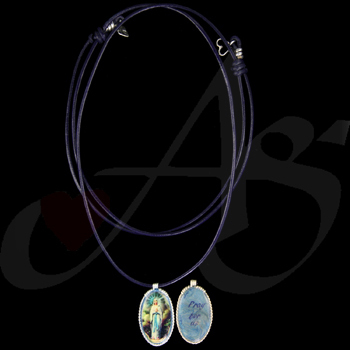 The centerpiece is an image of the Blessed Virgin Mary, with the following words on the reverse side: “I belong wholly to you | and all I have I offer you | O Most loving Jesus | through Mary, your holy Mother.” This necklace is tied with adjustable knots. This piece is currently available! If you would like this piece, a similar piece, or any unique piece of jewelry; contact us! Don’t forget to stop by our Facebook page,, Google+ page, Twitter, or our website for more fabulous pieces of jewelry! Today’s piece is a necklace. This necklace is made with hand twisted sterling silver wire and black ratstail. The centerpiece is a handmade pendant from polymer clay wrapped with nickel wire. On one side of the pendant is the Blessed Virgin Mary, and on the other side are the words: “I belong wholly to You | and all I have I offer You | O Most loving Jesus | through Mary, your holy Mother.” This piece is currently available. Today’s piece is a sterling silver watch. 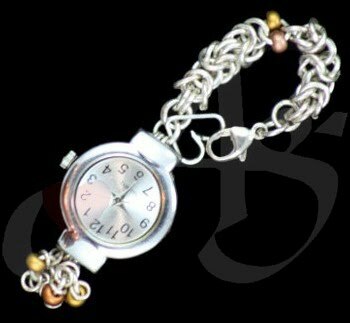 This watch is made with a series of difference sterling silver, .925, beads with a large lobster clasp. The watch body is sterling silver with a brushed silver face. This piece is currently available. If you would like this piece a similar piece, or any unique piece of jewelry; contact us! Don’t forget to stop by our Facebook page, Google+ page, Twitter, or our website for more phenomenal pieces of jewelry! Today’s piece is a pair of earrings. These earrings are similar to yesterday’s piece. However, because no two pieces are exactly the same, this set is made of brass wire. The ear hooks were even hand made – so this piece was made from three pieces of wire, rather than yesterday’s piece which only used two pieces. This piece is currently available! If you would like this piece, a similar piece, or any unique piece of jewelry; contact us! Don’t forget to stop by our Facebook page, Google+ page, Twitter or our website for more gorgeous pieces of jewelry! 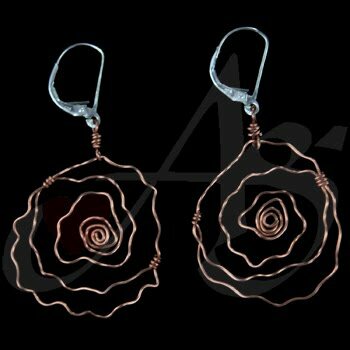 Today’s piece is a pair of copper earrings. Each earring was made from two straight pieces of wire. The lever-back earring hooks are hypo-allergenic. This piece is currently available! If you would like this piece, a similar piece, or any unique piece of jewelry; contact us! Don’t forget to stop by our Facebook page, Google+ page, Twitter or our website for more fabulous pieces of jewelry! Today’s piece is a watch. 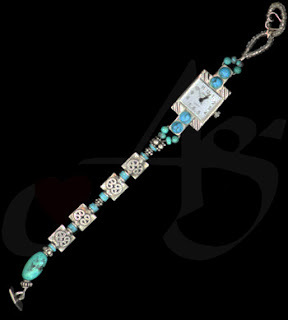 This watch is made with sterling silver beads and turquoise. The watch is strung on steel cable. There are small turquoises embedded into the watch face. The clasp is a button with two closure choices. This piece is currently available. If you would like this piece, a similar piece, or any unique piece of jewelry; contact us! 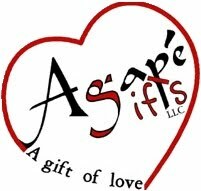 Don’t forget to check out our Facebook page, Google+ page, Twitter, or our website for more fabulous pieces of jewelry. Today’s piece is a necklace. This necklace was a special order. The centerpiece is handmade from polymer clay, with an image of St. Clair embedded on one side, and a crucifix embedded on the other. The pendant is strung on a black adjustable nylon cord. This piece is not available. Today’s piece is a pair of earrings. 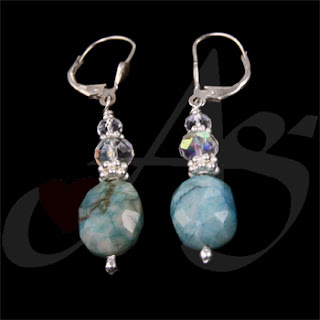 These earrings are made with an aquamarine turquoise, with clear Chinese crystals separated by sterling silver spacers. The findings on this piece are lever back earrings. This piece is currently available! If you would like this piece, a similar piece, or any unique piece of jewelry; contact us! Don’t forget to stop by our Facebook page, Google+ page, Twitter, and our website for more magnificent pieces of jewelry. Today’s piece is a pair of earrings. These earrings are made with large topaz Swarovski crystals and sterling silver hand made rings. This piece is currently available! If you would like this piece, a similar piece, or any unique piece of jewelry; contact us! Don’t forget to check out our Facebook page, Google+ page, Twitter page, and our website for more great pieces of jewelry. 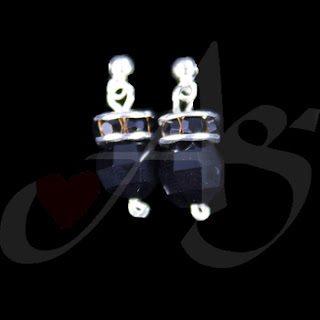 Here is another pair of earrings. These earrings are made with Swarovski crystals. 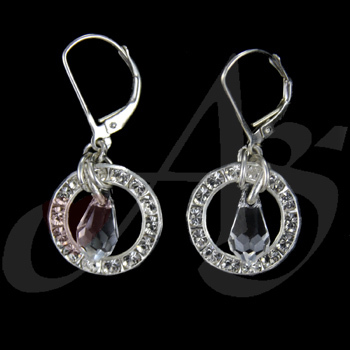 The circular crystals are set in a silver gin, and the center tear-drop Swarovski is attached to the earring with sterling silver wire. This piece is currently available. If you would like this piece, a similar piece, or any unique piece of jewelry; contact us! Don’t forget to stop by our Facebook page, Google+ page, Twitter or our website for more magnificent pieces of jewelry! Today’s piece is a pair of earrings. These earrings are made with Swarovski crystals. The circular piece is filled with small, clear aurora borealis crystal settings. 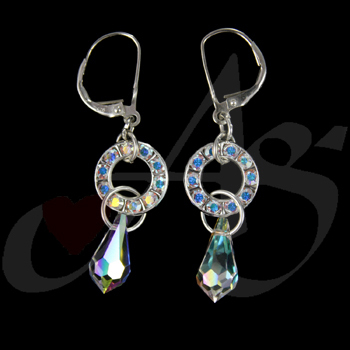 The larger teardrop is also a clear Swarovski crystal with an aurora borealis coating. This piece is currently available. If you would like this piece, a similar piece, or any unique piece of jewelry; contact us! Don’t forget to stop by our Facebook page, Google+ page, Twitter, or our website for more wonderful pieces of jewelry! Today’s piece is a bracelet. This bracelet is made with clear, aurora borealis coated, Swarovski embedded rings. The bracelet is made with a sterling silver hand crafted chain. This piece with a shimmering personality is currently available! If you would like this piece, a similar piece, or any unique piece of jewelry; contact us! Don’t forget to stop by our Facebook page, Google + page, Twitter, or our website for more wonderful pieces of jewelry! Today’s piece is a pair of earrings. 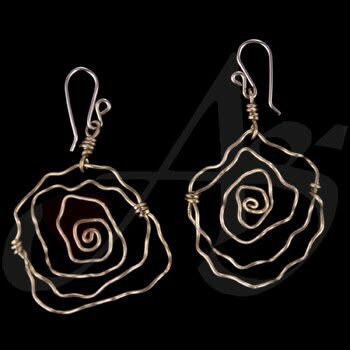 These earrings are hand made, hand twisted, and hand pounded. The thre circles are hand cut copper sheet metal. The crystals are a beige Swarovski crystal. These earrings are about2-1/2inches long. If you would to order a similar piece, or any unique piece of jewelry; contact us! Don’t forget to stop by our Facebook page, Google+ page, Twitter, or our website for more fabulous pieces of jewelry! Today’s piece is a pair of earrings. These earrings are made with black round faceted Chinese crystals on the bottom with small black faceted Swarovski crystals set into a roundel on top of the round crystals. The finding here, is a hypo-allergenic post. If you would like to order a similar piece, or any unique piece of jewelry; contact us! Don’t forget to check out our Facebook page, Google+ page, Twitter, or our website for more splendid pieces of jewelry! This piece is a Christmas Rosary. This Rosary celebrates the user’s Catholic history. This Rosary starts off with pictures from her baptism, then first communion, followed by pictures of her family, and ends with pictures of her confirmation. The stone used is a purple amethyst. As with all our Rosaries, this one is made with nickel wire and uses our unbreakable technology. If you would like to order a similar piece, or any unique piece of jewelry; contact us! Don’t forget to stop by our Facebook page, Google+ page, Twitter, or our website for more wonderful pieces of jewelry! Today’s piece is a necklace. 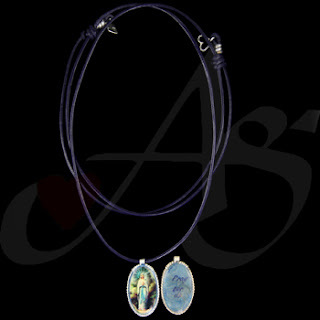 This necklace is made with dyed leather cording. 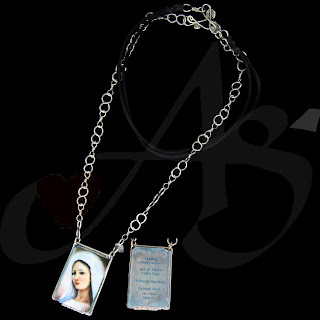 On one side is an image of the Blessed Mother Mary, and on the other side is a nickname called by the person who commissioned the piece to her sister, “Ghoul”, written in the sister’s handwriting. If you would like to order a similar piece, or any unique piece of jewelry; contact us! Please don’t forget to stop by our Facebook page, Google+ page, Twitter, or our website for more wonderful pieces of jewelry! Today’s piece is a necklace. 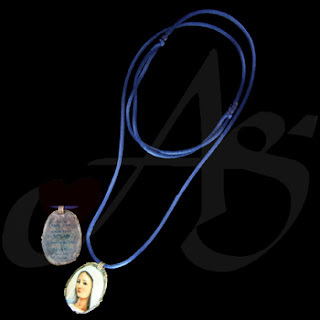 This necklace is made with blue leather cording and adjustable knots. 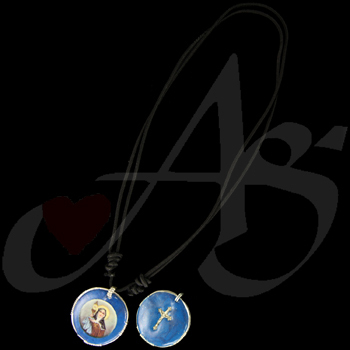 The center pendant is double-sided with an image of Our Lady of Lourdes on one side, and the saying, “Pray For Me” on the other. The center pendant is handmade from polymer and nickel wire. If you would like to order a similar piece, or any unique piece of jewelry; contact us! Don’t forget to stop by our Facebook page, Google+ page, Twitter, or our website for more beautiful pieces of jewelry.